The Committee for Human Rights in North Korea (HRNK), a non-governmental organization based in Washington, D.C., in collaboration with DigitalGlobe (NYSE: DGI), a leading global provider of commercial high-resolution earth imagery products and advanced geospatial solutions, have launched a report entitled North Korea’s Camp No. 25. Political Prison Camp No. 25 (a.k.a. Kwan-li-so No. 25) is located in Susong-dong, Chongjin-si, North Hamgyong Province, on the northeast coast of North Korea. While open-source information on the camp continues to be scarce, the Camp 25 political prisoner population is estimated to be around 5,000. 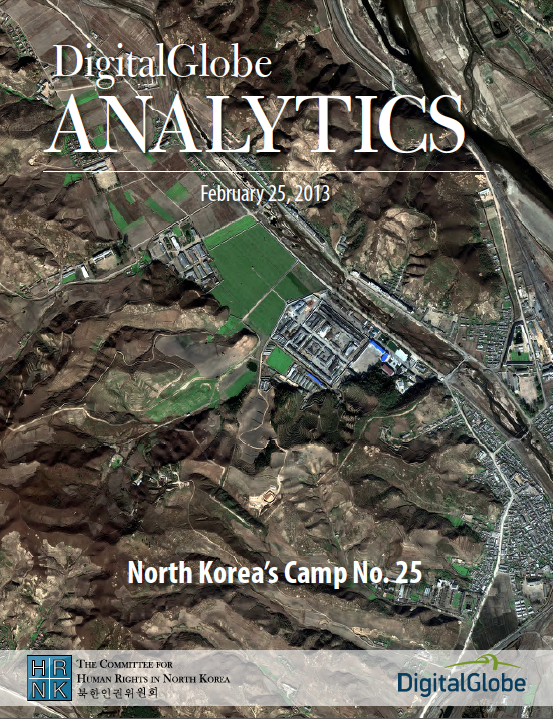 The report is the third product in a collaborative endeavor by HRNK and DigitalGlobe to create a clear picture of the evolution and current state of North Korea’s political prison camps. The previous two reports examined Camp No. 22, situated in Hoeryong, North Hamgyong Province. Under the arrangement, DigitalGlobe provides comprehensive analysis of new imagery that it acquires for this project, as well as analysis of older imagery saved in its archives. HRNK combines its own findings and those of DigitalGlobe in the final published reports. HRNK for its part is known for having put North Korea’s penal labor colonies on the map by publishing Hidden Gulag by David Hawk in 2003 and Hidden Gulag Second Edition in 2012. The research and imagery analysis confirmed that agricultural development, maintenance and construction activities have continued at Camp 25. Between 2009 and 2010, the camp perimeter increased from approximately 3,653 meters to about 5,046 meters, a 37 percent expansion. During the same period, the camp size increased from approximately 565,424 square meters to about 972,270 square meters, a 72 percent increase. While many of the original 20 guard posts detected in 2003 remain standing and operational until the present day, two were added in 2007, four in 2009, and 17 in 2010. In 2010, a new main gate was erected, and two previously separate agriculture fields in the northwest area of the camp were combined and the road between them blocked off, thus enhancing access control and ensuring that ordinary citizens have little or no opportunity to interact with the prison population or use the road adjacent to the camp. The reasons for the expansion could include: 1. An intensified crackdown on attempted defections, and higher than previously internment of defectors forcibly repatriated from China. 2. The purge begun in early 2009 in conjunction with North Korea’s second hereditary transmission of power, resulting in the imprisonment of those displaced from power, their families and their bureaucratic support groups. 3. The consolidation of North Korea’s political prison camp system, possibly involving the downsizing of some detention facilities such as Camp 22, and the expansion of others, including Camp 25. HRNK’s 2012 report Hidden Gulag Second Edition contains information about North Korea’s political prison camp system, where between 150,000 and 200,000 political prisoners, often three generations of the same family, are being held. It concludes with a “a blue-print” for disabling and dismantling the prison labor camp system. It recommends immediate access to the prison camps by the International Committee of the Red Cross (ICRC) and the World Food Program. It recommends the creation of an international commission of inquiry to investigate North Korea’s breaches of international human rights law and international criminal law, concluding that massive crimes against humanity are being perpetrated in North Korea. It calls on China to allow access by the UN High Commissioner for Refugees (UNHCR) to all North Koreans seeking refuge in China, and calls on the United States, the Republic of Korea and Japan to integrate human rights concerns into any future normalization of political and economic relations with North Korea. HRNK, established in 2001 by a distinguished group of foreign policy and human rights specialists, seeks to draw attention to human rights conditions in North Korea by publishing well-documented reports and papers, convening conferences, testifying at national and international fora, and seeking creative ways to end the isolation of the North Korean people. HRNK wishes to credit the role that DigitalGlobe experts are playing in this project, in particular Senior Analyst Joseph S. Bermudez Jr., Research Analyst Micah Farfour, and Publishing Editor Katelyn Amen. HRNK also wishes to thank Curtis Melvin for the advice he provided to HRNK staff and interns, and acknowledges the contributions of David Zeglen (Norwegian University of Science and Technology—NUST) and HRNK Editorial Consultant Rosa Park.